Barry Saunders and Simon Le-Chalmers, who owned the franchise's for Viva Soccer Gold Coast North and Viva Soccer Northern NSW, are both now, through a mutual agreement with Viva Soccer, running these regional areas as independent coaches allowing viva Soccer to concentrate on Metro areas. Barry and Simon believe that with coach and parent support, we set small bite-size goals for young players with a developmental focus on trying to improve performance gradually and in small increments. When progress is swift, accept it and reassess the goals, then move on to the next challenge. Through our programs we provide a safe, fun and structured environment where children can learn at their own pace from our foundation grassroots programs up to aspiring young talented players. All our coaches are FFA qualified, have current working with children checks and all coaches that run their own program must hold a current First Aid certificate. Simon was born in Colchester in the UK and has played soccer since he was 5 years old. As a teenager, he had trials for West Ham and Colchester Utd and at 18, he played at Mercer County Community College, Trenton, New Jersey, USA on a 2 year soccer scholarship where the team won a National Title. After that, Simon played for several senior men’s teams in the USA and UK as well as playing the odd game in the Men’s Over 35’s competition at Musgrave, Gold Coast. Simon brings a wealth of coaching experience from the UK and USA as well as here in Australia. His qualifications include the FFA ‘C’ License. 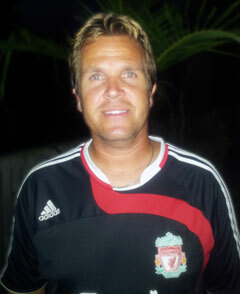 He is an ex-Franchisee for Viva Soccer Gold Coast North, where for the past 3 years he has coached over 2000 Children. He is currently the Junior Director of coaching at Coomera Colts Soccer Club. Simon and his two children all support Liverpool FC in The English Premier League, but unfortunately his partner is a Man Utd fan ! His favourite player is Stevie Gerrard ! Simon sees his current coaching role at SIBA Soccer as a great way to help promote ‘the world game’ here in Australia. Barry has played football for many years starting in South London in the UK and then in Sydney, FFNC and then on the Gold Coast. He has been involved in development coaching since 1999 mainly in Sydney and on the Gold Coast. He obtained his first diploma in training and development in 1998, since then has many coaching qualifications built up over the years including a FFA community instructors License and is a well-respected coach within the football community. 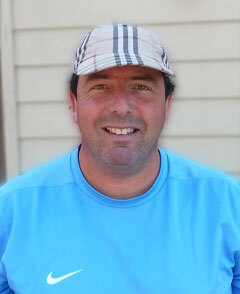 Barry has organised and hosted various coaching seminars and is currently involved in coaching in the Tweed region. Barry has provided football coaching in schools, clubs, local and state associations and has received an Australian government sport achievement award for junior development.